Is Bus Travel BETTER than Flying? USA Today says – YES! Home / Is Bus Travel BETTER than Flying? USA Today says – YES! 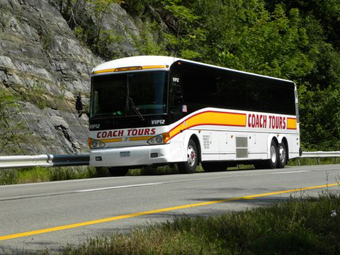 USA Today just published an article of on bus travel that is very pertinent and interesting. The gist of the article is that traveling by bus is a GREAT customer experience and because of that – there are virtually no complaints filed by bus travelers! Compared to other travel options like flying – this is an incredible statistic. Bus travel is also less expensive than taking a flight to your destination, and has over a 90% on-time track record! AND with over 80 million passengers each year – keeping them all enthusiastic and happy is quite an accomplishment according to USA Today! One additional thing that we have always promoted is that so many customers have expressed how great it is to see the landscape of the country and cities from their view through the large panoramic tour bus windows. They are truly windows to the world – allowing a one to one connection to the beautiful minute by minute changing scenery right outside. That can be so much more inspiring and interesting than staring at the top of a cloud for the entire duration of the trip. Also, being on the road enables one to discover the nooks and crannies between destinations. With a planned tour bus route or charter travel, your itinerary can include those special little stopping points – the less touristy attractions, or the amazing local restaurant. Bus travel is safe. Period! Look at the statistics. Travelers can rest assured that the professional drivers and equipment are as good as it gets. So when the opportunity comes around next to go visit relatives in Chicago, or attend a conference in Miami, or get a group together for the NFL Playoff game in the next state – consider something different for the new year – and create a bond with the countryside AND your traveling companions!